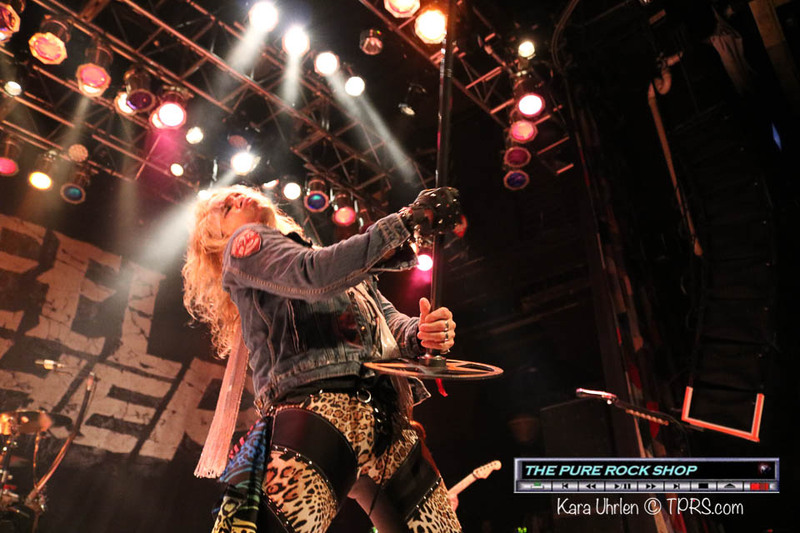 Last week, The Pure Rock Shop had the opportunity to witness the comic genius of Steel Panther. Follow us back in time to an interview we had with Michael Starr just after filming a Discover Card commercial under the band name Danger Kitty. Exclusive Questions and Answers with Discover Card Star Michael Starr. The Pure Rock Shop caught up with Starr to bring you this exclusive behind the scenes interview. 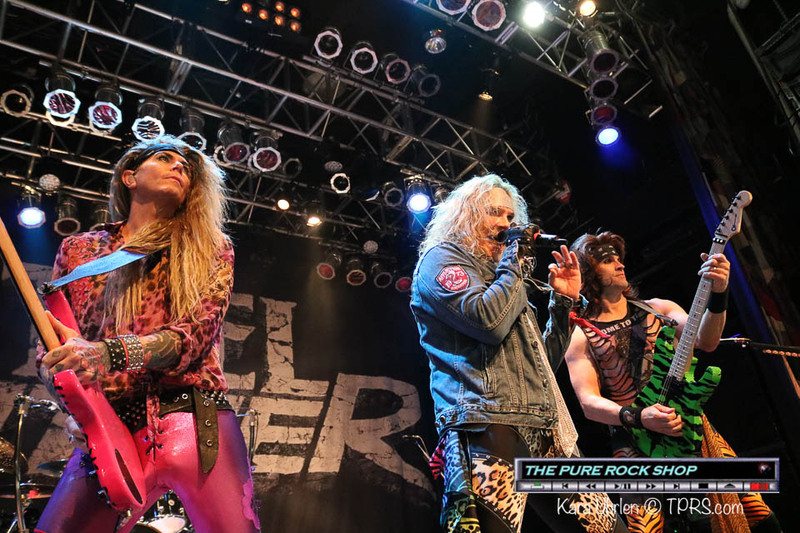 Read on to find out what’s new with Steel Panther, and learn how they became the band known as Danger Kitty. TPRS.com: Michael, we’ve heard that you and guitarist Rikki Ratchet were once rivals in high school. Why did you decide to join forces? What year was that? Starr: He was the only guy in my school with long hair and a guitar and a car. He lived with his parents still and I knew we could practice in his basement. Plus, I figured we could write really great music together because of all the emotion between us being in rival bands and all. But, that never panned out. Rachet can’t write; he couldn’t even read (I don’t mean read music either). TPRS.com: Did you know then that you were destined to be a rock star? Starr: As soon as I changed my name I knew. Even if I never became a full-fledged Rock star I still had a Rock star name. 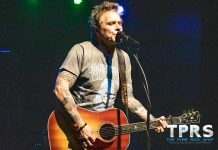 TPRS.com: After living the life of a star do you ever wonder what life would have been like had you stayed in Akron and kept playing shows at the Agora (which BTW is now a country bar)? Starr: I don’t know. I sometimes miss those days. At least I could stay at my mom’s house and not work. I mean I make tons of money being in Steel Panther but I mean, I mean just being in a band with Rachett is work. TPRS.com: Tell us about how you hooked up with Mike Varney from Shrapnel Records and got your first big break? Starr: He saw us at a party. We drank beer all night and then he decided to sign us. I think he was drunk, but nevertheless we got our deal and he had a hangover that lasted him a very long time. 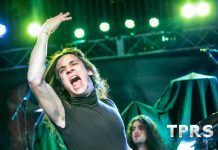 TPRS.com: I understand that you had an “embarrassing illness” that ended your biggest tour, and really triggered many events that lead to the band’s destruction. Now that you have reformed, are there any hard feelings from your bandmates? Starr: L.S.D (Lead Singer Disease) is overrated. It just alcoholism. I drank everyday for years and then I got mixed up with some fans that smoked crack and then that was all that was important to me. Music meant nothing except a way to meet more fans that had crack for me to smoke. So now, I just don’t drink so I don’t trigger the S.F.F.W.C. (Search for Fans With Crack) syndrome. TPRS.com: With your careers realistically being washed up, how did you guys end up landing a spot in a nationwide commercial? Starr: First off!! Our careers are never washed up. We still have a million fans that could be ours in the future. So, being washed up is a state of mine. In our case the only way for us is up now. Overseas was a big market for us, but now we are here and everyone loves us. I have a Discover® Card and I use it all the time. I called Discover® Card and asked them to do a commercial on us. They said no, but five years later, a friend of ours owns a casting house where the Discover® Card auditions were being held, and she tipped us off. So, we went down and crashed the casting and booked the job. They didn’t remember that I called. TPRS.com: Being in the spotlight again with your recent appearance in the Discover® Card commercial and upcoming cameo in the Metal God/Rock Star feature film, there is the possibility of your fame rising once again. So, honestly, tell us which you enjoy more, playing more intimate events like keg parties or playing arenas? Starr: Lets be honest, keg parties are cool if your going to drink for free, but not to play. Madison Square Garden is where a band like us belongs. TPRS.com: Staring on the big screen must be exciting. Do you think that your acting career will interfere with the band or do you hope to do both? Starr: Well, I look at my friend Jon Bon Jovi. He did it. Why cant I? TPRS.com: Do you have any plans to live off the free exposure from the commercial? Starr: Of course, I get free movie rentals from my friends that see me on the tv. TPRS.com: Is there any chance we may catch you on Broadway soon, or are you sticking to the big screen? Starr: I tried that six years ago, thanks to Nirvana. Never again. TPRS.com: Who hooked you up with your bass player Ginger Roxx and drummer Blackhead? Who were the original drummer and bass player? Starr: I don’t really remember I just remember driving out the L.A., and playing our first gig without a drummer or bass guitar player and it didn’t go over very well. That’s when we decided to make it a four-piece band. TPRS.com: Of the four of you, who owns the most clothes? And who has the biggest hair? Starr: Me. I have the most clothes and the most hair out of anyone I think here in L.A.
TPRS.com: Who designs your clothes? Starr: I have all mine made for me by my seamstress Mel Olivas. She is the best. I come up with ideas and she creates my idea for me. TPRS.com: Would you like to make it more interesting and tell us who’s been the most successful with your female fans? Starr: Ginger Roxx gets laid all the time. That’s why he is in the band. He can’t really play bass that well. He used to work at a Hotdog stand before Steel Panther and he never played bass. He was a singer, but he can’t sing that well either. But, he looks like a million bucks at 45 years old. TPRS.com: Of all the perks during the upside of your career, what would you say was the greatest? Starr: Towels – thousands and thousands of white free towels. TPRS.com: I understand that the new lineup has just recently finished a demo tape that is rumored to be stirring up major label interest from both Atlantic and Arista records. Is that true? Starr: Kind of. We did do a demo but it’s only one song, and we use it for intro for our live show. The labels told us to write some more so we have called Desmond Child and some other writers to help us out… We have been calling and calling Mutt Lange, but we haven’t heard back yet from him. I know he’s hot on this project and he can write ok too. TPRS.com: Your commercial has reached a national audience of fans old and new. But for those who have yet to see you live or purchase your albums, can you please describe exactly what melodic power rock and progressive metal blues sounds like? Or offer an explanation of who your biggest influences have been? Starr: You said it all. We are melodic. We are powerful rock. We add some progressive tastes to our music and we have a blues base metal twinge. It’s very unique. We do all this every Monday night at the Viper Room in Hollywood. TPRS.com: How is the hotdog shop doing these days? I understand the fajita dog is a big seller? Starr: I don’t know. Ginger is the expert. 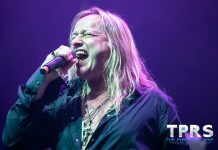 TPRS.com: Is it true that Steel Panther actually opened for Stanley Eisen & Wicked Lester (the original band Paul and Gene were in before KISS…by coincidence there is an Akron band called Wicked Lester as well!) at the Smuckler Bar Mitzvah that was mentioned in your commercial? Starr: Yes it is true. Wow, you guys sure do your homework. Did you know that KISS stole the idea from us to wear make-up? TPRS.com: There is a persistent rumor that you were denied a Discover® Card before the commercial endorsement came through. Do you have any hard feelings? Starr: It is not true. I have a card with a $200.00 limit. TPRS.com: Blackhead (A.K.A. Dances With Leatherwolf) seems to be a universal drummer playing with UDO and Warlock (Germany), Gorky Park (Russia) and Survivor and VVI (USA). How does someone from an Indian reservation in South Dakota get around so much? Starr: His family – for years – have beat stuff. His dad beat his mom and his mom beat him. That’s why he likes the drums so much, and that’s why he plays with such passion. People like that about him, and if he gets out of line you just beat [him] a little and he is quiet. He is easy to work with. TPRS.com: Ginger Roxx appears to be in the wrong place at the wrong time. He leaves Brunette who then got signed as Hardline. Mozart gets signed to a huge deal by SBK, promptly get dropped then reappear years later as The Flys. Is he the sacrificial lamb if a record deal is imminent for Steel Panther? Starr: Do you believe in Destiny? Steel Panther is meant to be. That’s all I know. TPRS.com: Can you give us one last quote summing up your mission as Steel Panther? Starr: Metal is coming back whether you like it or not, so start growing your hair so [that] your not left with having to get extensions.